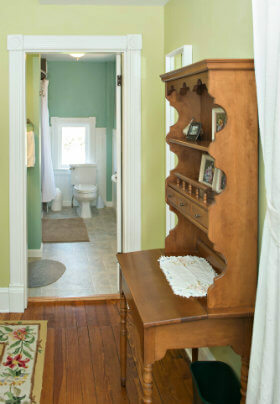 You will find The Willow Room on the west end of the second floor, across the hall from the stocked guest refrigerator. 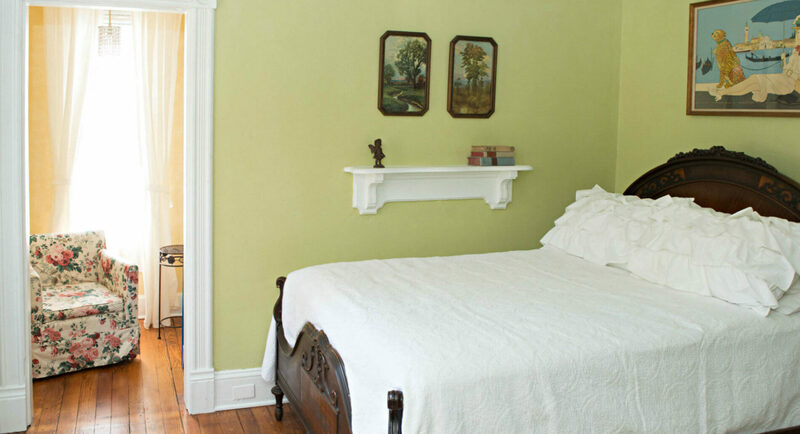 This, the smallest guestroom (shall we call it cozy?) at Laurel Manor House Bed and Breakfast, is the ideal accommodation if you are traveling alone, or if you and your partner do not mind smaller quarters. The Willow Room is named for the sixty-year-old willow oak tree,which canopies Montgomery Street on the front edge of the property. The Willow Room is furnished with a beautiful antique double bed, a small table, a full-length mirror, and high-speed Wi-Fi (throughout the house). 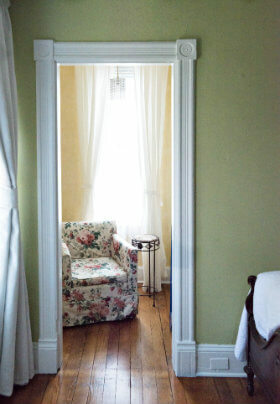 You will adore The Willow Room’s quaint reading nook with an east-facing window. It is outfitted with a petite upholstered chair, bookshelves, and a crystal-draped overhead light. The private en-suite bathroom has a cottage feel, with original white-painted wainscoting, a stone-topped sink vanity, and a beautiful ceramic-tiled bathtub enclosure with shower. Other amenities include: a hairdryer, soap, and shampoo. For corporate lodging, our B&B is conveniently located near Columbia, MD and mid-way between Baltimore and Washington, DC. Government rates are offered for military and federal employees on business.